Try these Eggplant Roll-ups stuffed with spinach and ricotta for a lighter and absolutely delicious dinner, they can also be prepped in advance to make weeknight meals even easier and tastier! Preheat the oven to 180°C/350F/gas mark Cut the eggplant/aubergine into thin slices and place on a lined baking tray. Drizzle with a little olive oil and bake for 15 minutes until tender. Set aside to cool. Meanwhile add half tbsp of olive oil to a frying pan and add the spinach, stir so it doesn’t burn until completely wilted. Remove from the pan and let cool. To make the tomato sauce, add a tbsp of olive oil to the frying pan. Finley chop the shallot and garlic and add to the pan. Sauté for 1 minute then add the chopped tomatoes, water, tomato purée, oregano, sugar and season with salt and pepper. Let the sauce reduce and simmer for 10 minutes. Finley chop the spinach and add to a large bowl. Add the ricotta, parmesan, nutmeg and a pinch of salt and pepper. Mix everything together until thoroughly combined. To assemble the eggplant roll-ups, add a spoonful of ricotta mixture (about a heaped tbstot he widest end of the eggplant then roll it up. Repeat with the rest of the eggplant and ricotta mixture. Add 3/4 of the tomato sauce to the bottom of a baking dish. Arrange the eggplant roll-ups in the baking dish then top with the remaining sauce. Top with mozzarella then bake in the oven for 20-25 minutes until the mozzarella is golden and melted and the eggplant is heated right through. 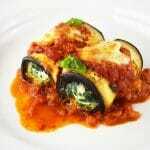 To make in advance, assemble the eggplant roll-ups and place in the fridge until ready to use then place in the tomato sauce in a baking dish before baking.